Singapore River Festival 2008, originally uploaded by ZackTwin. I bought a prosumer camera, Sony H5 in 2007 without doing a proper research. I wished to take better photos than existing Nikon point-shoot-camera, so I decided to own a better camera, but I was not sure what camera to buy. I was not thinking to have DSLR at that time because the cost to own a DSLR at that time was not as cheap as today. I still remember that I was checking features of Canon PowerShot S3 or Sony H5 as both were within my budget. One weekend, I talked about buying camera with a friend in City Hall (Singapore). He suggested we should go and check cameras in the shop in Funan. So we went to Funan and saw Song Brother Shop there. We go in the shop to ask the camera prices and see the cameras. When I saw Sony H5’s big and clear LCD, I was so excited and bough it immediately. I paid that camera for nearly S$900. At that time, I didn’t know about camera shops; John in Funan or Cathay in Peninsula which are good cameras shops in Singapore. Prosumer cameras have more features than point-and-shoot, like allowing you to change shutter speed and aperture but lens. Moreover it has smaller censors than DLSR which I totally didn’t know until I owned it. How naïve I am? Getting restriction feeling after using prosumer camera and its incapability to take good night shoots made me think to get a DSLR camera, especially after taking photos of Singapore River Festival in Sept 2008. 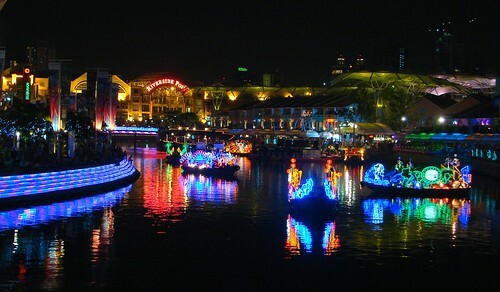 This is the one of photos I took during Singapore River Festival 2008.